Complete your full PADI Open Water Certification in just 3 days! Dive at some of the world's best wreck and reef sites! If you are looking to finally get your PADI Open Water certification, then there is no better place on the planet to do this than in the islands of the Bahamas! With countless top-notch dive sites just within a few miles from the shores of New Providence Island, diving in Nassau Bahamas is considered by many to be some of the best anywhere in the world. With Scuba Dive Bahamas, you will get the opportunity to complete your full Open Water certification with one of the best dive instruction teams around and you will get the chance to explore some of the most incredible dive sites, including both shipwreck dives and coral reef garden dives. Our PADI E-Learning Certification Course allows you to complete your certification in less time! The “E-Learning” portion of the certification gets completed prior to arriving in Nassau, from the comfort of your own home. This is done directly through the PADI website. Once completed, you will be prompted to print out your certification of completion to bring with you to Nassau. Once in Nassau, it’s time to finish the certification! The PADI E-Learning Certification Course continues in Nassau with your pool instruction. You will meet your dive instructor and he or she will teach you how to use your scuba diving gear in a pool setting. By this point, you will have already learned all about the equipment through your online course, and now you will get to actually use the equipment. Before you know it, you will be swimming underwater with all your gear. Once your instructor feels that you are comfortable and knowledgeable with the gear, it’s time to get on our boat and head out to sea! The last portion of the PADI E-Learning Certification Course will be your four check-out dives. Over two days, you will head to four different Nassau Bahamas dive sites, including both wreck sites and also coral reef sites. At each of these destinations, you will scuba dive alongside your instructor, as you swim among some of the most beautiful and colorful underwater habitats in the world. 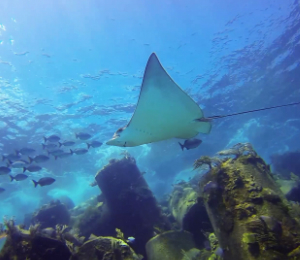 Scuba diving in the Bahamas is something that you will remember for the rest of your life! After you have completed the four check-out dives, you are certified! Your PADI Open Water certification will give you the knowledge and license to scuba dive anywhere in the world at dive sites of up to 60 feet. You will be given your certification card and then it’s up to you to start your journey as a certified scuba diver! Students signing up for the E-Learning Referral Course MUST have completed their PADI Online E-Learning course prior to arriving in Nassau. Certificate of completion must be presented with students. I have been to the Bahamas many times, but Nassau PADI E-Learning Referral Course is one of my favorite trips! It includes everything that everyone should do here. As a Bahamas veteran, I can say only the best about this experience!